Get ready for an epic ride all the way into Arizona! From our meeting point on the south edge of Henderson, we'll ride the Union Pacific and River Mountain trails into Boulder City for our first rest stop. After that, the real fun begins. We'll get on Highway 93 and quickly descend almost 1,000 feet (good practice for the morning of Day 6) into the Lake Mead National Recreation Area. We'll stay on 93 as it becomes a freeway (also good practice for the event) and descends even more to the Mike O'Callaghan-Pat Tillman Memorial Bridge, which takes us across the state line into Arizona. When we reach the first exit in Arizona, we'll leave the freeway, turn around, and head back across the bridge on the wide, smooth shoulder ... and where the throngs of sightseers on the separate walkway will undoubtedly gawk at the sight of bicyclists and might even take a picture of you to show the folks back home. As if that weren't enough, next we'll descend all the way down to Hoover Dam itself and ride across the top of the dam, just back across the state line into Arizona, before turning around and beginning the moderately steep climb back up to Highway 93 and the entrance to the Lake Mead scenic drive. But wait, there's more! 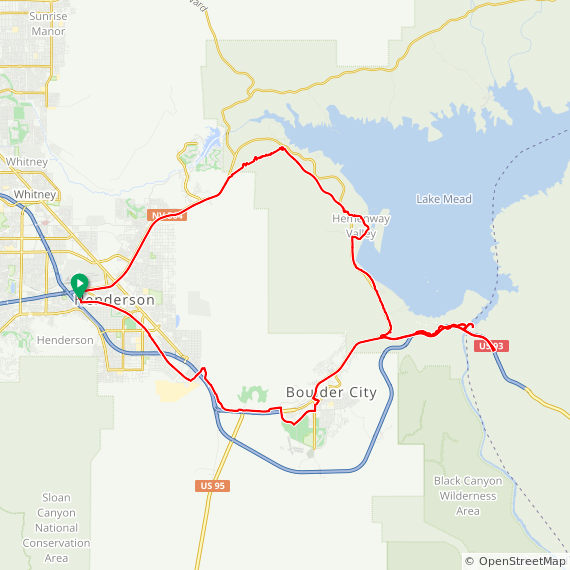 We'll then ride the River Mountains Trail (no fee for riding the trail) along the edge of Lake Mead and all the way around the recreation area for about 14 miles and up to the Lake Las Vegas area. (This is a more gentle ascent than the steep hill on Highway 93 that we descended earlier in the day.) And after a final rest stop, it's an easy ride (albeit with a bit more traffic) back to the Fiesta. Ride With GPS reports about a robust 4,200 feet of climbing for this ride. Toilets, water, and a Starbucks (of course) are available inside the Fiesta. Park and meet in the rear parking lot partway up the hill on Fiesta Henderson Blvd. just past the parking garage, toward the train tracks. Important: This ride passes through a mandatory Homeland Security checkpoint on the access road to Hoover Dam. Although ID checks and searches are rare, bring a photo ID and, if you aren't a U.S. citizen, proof of citizenship.